On a recent visit to Japan I got to see the poetry card game Karuta being played for the first time. Karuta is based on 100 ancient tanka from the Ogura Hyakunin Isshu, a selection of a 100 poems by 100 poets who were writing between the seventh and thirteenth century. Tanka (fomerly known as waka) are five line poems. They have a 57577 syllable structure. Junior High School Students have to learn these tanka by heart and are tested on them as they enter high school. One Friday afternoon at Hiroshima University High School, Fukuyama we watched Grade 8 students playing Karuta with incredible enthusiasm and speed. Seated in groups of 4, each Grade 8 student had 25 of torifuda cards spread out in front of them. (These have the last two lines of the poem written on them.) A fellow student at the front desk declaimed the first three lines of a tanka she selected from a set of yomuifuda (or reading) cards. It was then up to the students to find the torifuda card (containing the last two lines) that matched it. If they found the card on their own table then they removed it. If they found it on an adjacent table they grabbed it and gave the other student one of their cards in its place. The idea of the game is to clear your own table before anyone else does – and also of course to learn the poems. The students were not only preparing for a test they will take at aged 15 but also for a Karuta competition, which is held in the school every February for volunteer teams for every junior high school grade. There are also fiercely fought national competitions (with many examples of these on YouTube) and Karuta is a popular New Year family card game. Observing the game was just one highlight in a fantastic visit to Japan as a guest of the University of Hiroshima (funded by the Japanese Society for the Promotion of Science). During the visit I also led workshops on poetry writing and pedagogy, gave a poetry reading and a research keynote entitled Finding, Writing and Researching Poetry. I met enthusiastic Masters students, Junior High school students and teachers, teacher educators, researchers and poets who were all keen to try out new approaches, share writing in progress and talk about poetry. In talking and working with them I learned a good deal about the place of poetry in the Japanese curriculum and about Japanese poets. The trip was filled with many great poetic experiences. I hope it will mark the beginning of new poetry research work with Dr Yuka Nakai and her colleagues. 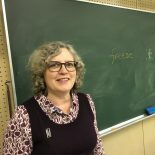 This entry was posted on January 14, 2018 by Sue Dymoke and tagged Japanese poetry, Japanese Society for the Promotion of Science, Karuta, Ogura Haykunin Isshu, Tanka, University of Hiroshima.